Somehow this film, approaching four years old, has evaded me until only a few days ago and I've now watched it twice. 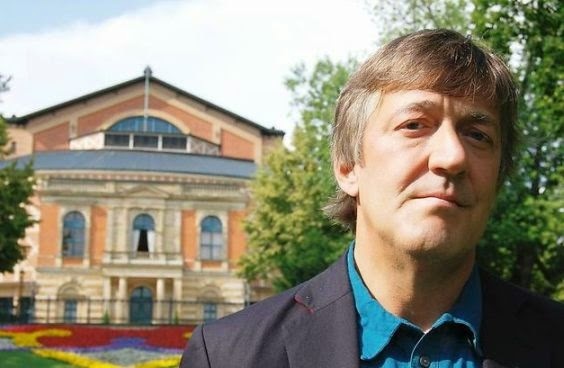 The BBC produced documentary finds Stephen Fry, an ardent fan of the music dramas of Richard Wagner, exploring Wagner's world while wrestling with his own Jewishness and the composer's anti-Semitism. Jewish cellist who survived Auschwitz, Valery Gergiev, a clearly irritated Eva Wagner (whose German coolness can barely tolerate Fry's exuberance), costumers, and others, (all too briefly), with each shedding their own light on the myriad aspects of Wagner's creative genius and his role within and without music. His schoolboy enthusiasm may irritate some as in a constant of awe, he reveres a doorknob, Wagner's chair, boxes of wigs, costumes and props, but again, there is an earnestness here that I found endearing . . . and amusing. 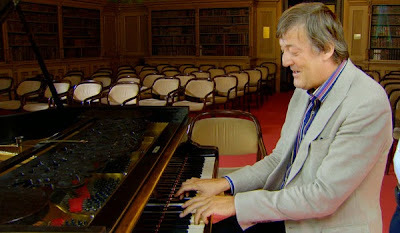 The most satisfying musical "bit" explores Tristan und Isolde, as, with Fry, we wander into into the villa Wahnfried, catching Stefan Mickisch playing the snippets of the Liebesnacht and Liebestod on Wagner's own Steinway. whilst explaining the nature of a certain "chord." 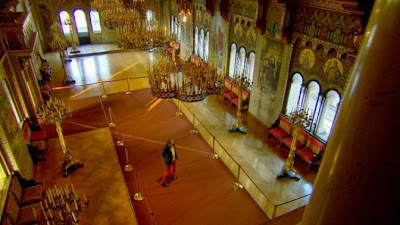 As Mickmisch plays, the scene intertwines with a live performance (Robert Dean Smith and Irene Theorin, looking more like Richard and Pat Nixon than the legendary Irish Princess and her consort). During the final pages of the Liebestod we weave back and forth between an ecstatic Fry and his pianist friend, and Theorin's Isolde, creating a magically, satisfying effect. It's the best part of the film and a wonderful moment. Since watching I've had several discussions with friends who deplored the movie, claiming it to be too "vapid" and complaining it didn't go deep enough into Wagner's life and creative process. I could only counter by explaining, the name of the film is "Wagner and Me" not "Wagner and You" or "Exploring the Creative Genius of Richard Wagner," etc. It's one man's sharing of a deeply personal journey and as such, it succeeds marvelously. If you like Stephen Fry and love Wagner (as I do), and haven't yet seen this, I give it a hearty and heartfelt recommendation.